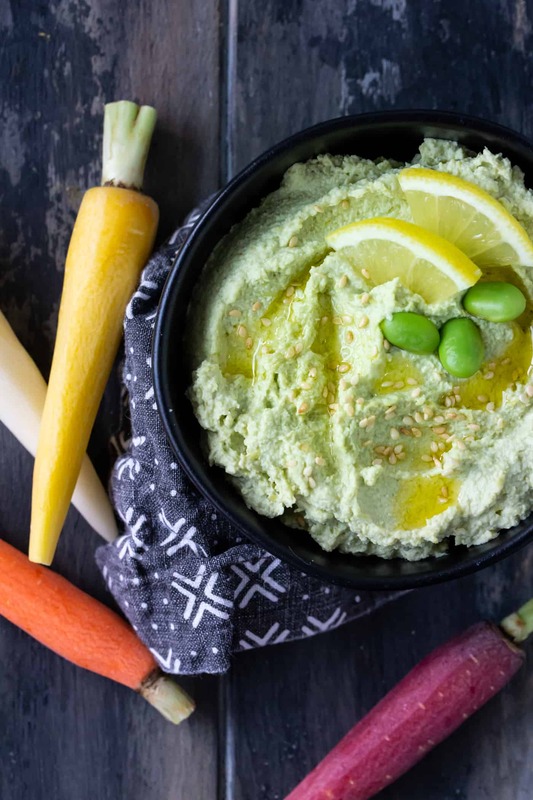 Makeover your usual veggie dip with this protein-packed Edamame Hummus recipe. We all aim to snack healthier, right? 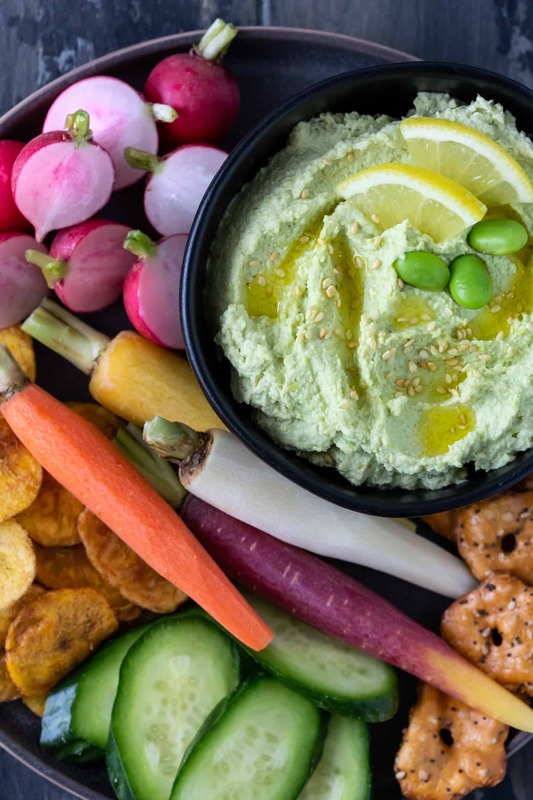 So let me introduce a tasty new option to your snacking arsenal – this easy homemade Edamame Hummus recipe. 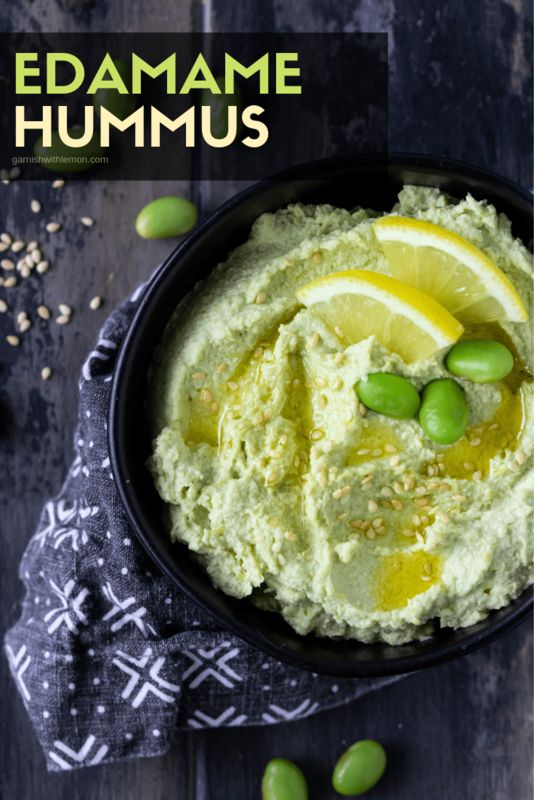 Made with edamame instead of chickpeas, this tasty dipper is chock-full of all the good stuff – protein, fiber and minerals – to give this hummus an edge over all the others. Edamame is just another name for boiled or steamed soybeans. It’s a popular first course when you visit a Japanese restaurant, and they are actually much tastier than they sound (especially with a liberal sprinkle of sea salt). It’s a powerhouse of a legume that should definitely have a place in your snacking repertoire. But I thought hummus was made with chickpeas. 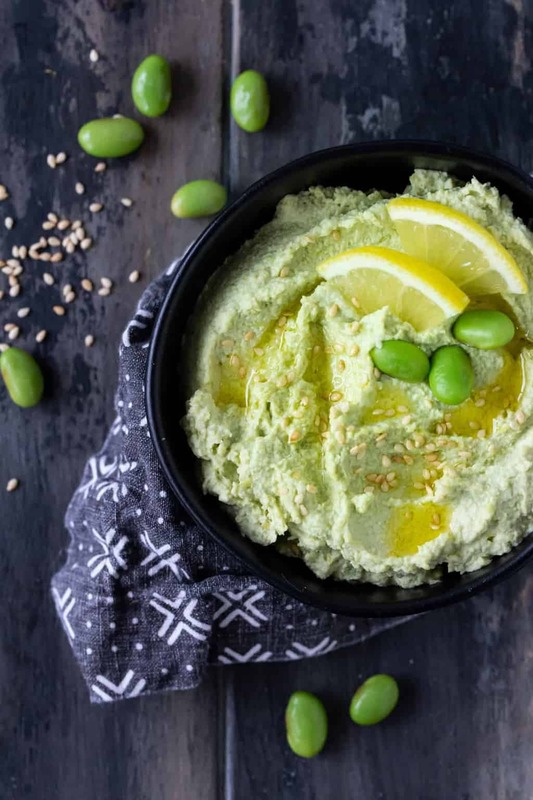 Is this edamame hummus recipe made without them? That’s right; there are no chickpeas in this edamame hummus recipe. Steamed edamame replaces the traditional chickpeas as the star ingredient in this edamame dip. The usual cast of suspects is still there – olive oil, tahini, garlic and lemon juice – but the slightly sweet edamame gives this creamy snack a tasty punch. Is it easy to make homemade hummus? If you have a food processor or high-powered blender, you can quickly and easily whip up homemade hummus recipes. You certainly CAN make your own hummus if you don’t have a food processor or blender, but it’s definitely more time-consuming and requires some elbow grease to get a smooth consistency. Can I make this edamame hummus in advance? Absolutely! This edamame dip will keep for up to two weeks in the fridge. What do I serve with edamame hummus? Anything you’d serve with a chickpea hummus! The options are endless. My favorite dippers are any variety of sliced veggies as well as some hearty seeded crackers or crunchy breadsticks. Are you hummus-crazy like we are? Here are some more fun flavors to try! Place all ingredients into a blender or food processor and process until well combined. Store in refrigerator. I love hummus. And I love edamame. Never would have thought to put two together – this is so genius! Unexpected pairings are the best! Thanks, Heather. We love it, too! It’s a fun twist on our regular hummus, that’s for sure! I’ll always reach for a healthier dip option, especially if it involves edamame, I just love the texture of it! I love dips in general, so a healthier dip is like a double bonus for me, Nicole!